With no hills, plenty of bike lanes and beautiful, historic avenues covered by canopies of Live Oaks, this magical city was made for biking. Whether you're visiting New Orleans or you're a local, the New Orleans Beyond the French Quarter Bike Tour has something for everyone! 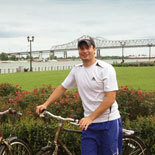 New Orleans Beyond the French Quarter Bike Tour is the perfect tour for those wanting to experience New Orleans with minimal effort. The fully licensed tour guides will offer you an insider's look at the 'Crescent City' and give you a peek at what makes New Orleans 'The Most Interesting City in the World'! Tour Highlights: Treme Neighborhood - Formed at the end of the 18th century, Treme was the first neighborhood established by "free people of color." The neighborhood helped give rise to jazz and some of its most talented practitioners still live there today. Saint Louis Cemetery No. 3 - This is one of New Orleans best kept cemeteries. 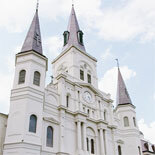 Learn the reasons for above ground burials and New Orleans' Funeral traditions. Louis Armstrong Park - named after one of the city's favorite sons. You'll enjoy the greenery, fountains and history of this beautifully manicured park. Faubourg Marigny - The historic New Orleans neighborhood laid out by the eccentric Bernard de Marigny in the early 19th century. This neighborhood retains much of de Marigny's eccentric nature and is a hot bed for art, music, and culture. 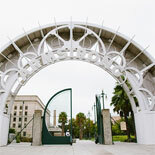 Congo Square - Don't let this quiet corner in Armstrong Park fool you. Every Thursday evening this spot hosts free concerts. And, if you're able to pass through on a Sunday afternoon, you'll catch the Drum Circle, a tradition dating back to the mid-1700s. Avenue of the Creoles - Esplanade Ave, also known as the Creole Millionaire's Row, stretches from the river to City Park and is lined with the most beautiful houses and mansions in New Orleans. Explore the neighborhoods in New Orleans that most tourists don't get to see. Biking through a new city is one of the most intimate and personal ways to interact with its culture and history. New Orleans has a fun and unique story. Don't wait to see all that she has to offer. 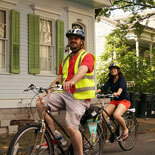 Make your reservations and get your eTickets now for the New Orleans Beyond the French Quarter Bike Tour! 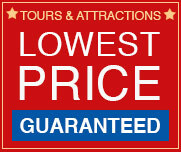 An Insider's Look At "The Most Interesting City In The World"
Jan 1 - Dec 31, 7 days a week at 9:30 am and 3:00 pm. Reservations need to be confirmed in advance. 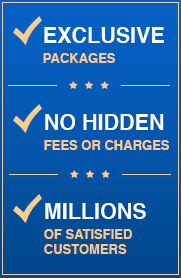 E-Ticket will have details. Closed on: Jan 1, Jul 4, Thanksgiving, Christmas Day and Mardi Gras. Meeting Point: 214 Decatur St, New Orleans, LA 70130. Directly across from the House of Blues, in the French Quarter. Public transportation is suggested. There are parking lots around the area, but Bullfrog Tours does not have a designated parking lot. Child Ticket: ages 4-12 yrs old. All children who participate must be able to ride their own bike.